A leggy cosmic creature, actually the "hiding galaxy" IC 342, comes out of hiding in this new infrared view from NASA's Wide-field Infrared Survey Explorer, or WISE. Full Story. A spiral galaxy that is usually shrouded behind our ownMilky Way has come out of hiding in a new infrared image from NASA's latestspace telescope. The new photo reveals a leggy cosmic apparition called IC342, sometimes known as the "hidden galaxy," and was snapped by the Wide-fieldInfrared Survey Explorer (WISE). The WISE space telescope is mapping the sky inunprecedented detail to find previously unseenasteroids and other objects. Stargazers and professional astronomers typically have a difficulttime seeing this galaxy through the Milky Way's bright band of stars, dust andgas, but WISE's infraredvision penetrates through this veil, offering a crisp view. In a spiral galaxy like IC 342, dust and gas areconcentrated in the arms. The denser pockets of gas trigger the formation ofnew stars, which is represented in green and yellow in the photo. The core, shown in red, is also bursting with young stars,which are heating up dust. Stars that appear blue reside within our MilkyWay, between us and IC 342. 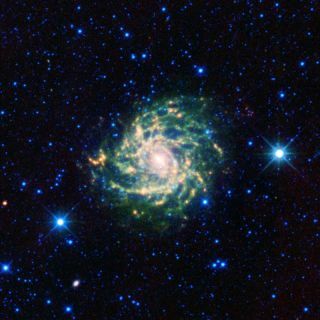 This galaxy has been of great interest to astronomers becauseof its relative proximity to our planet. Yet, determining its exact distancefrom Earth has proven difficult due to the intervening Milky Way. The famed late astronomer Edwin Hubble, after whom theHubble Space Telescope is named, first thought the galaxy might belong to ourown Local Group, a neighborhood of about 40 galaxies that includes the MilkyWay and Andromeda.But current estimates now place it farther away, at about 6.6 to 11 millionlight-years. NASA launched the WISE space telescope in December 2009. Itis expected to complete its initial survey of the sky in the first six monthsof its mission.